School is starting soon and it’s time to think about how to organize your kid’s school papers. 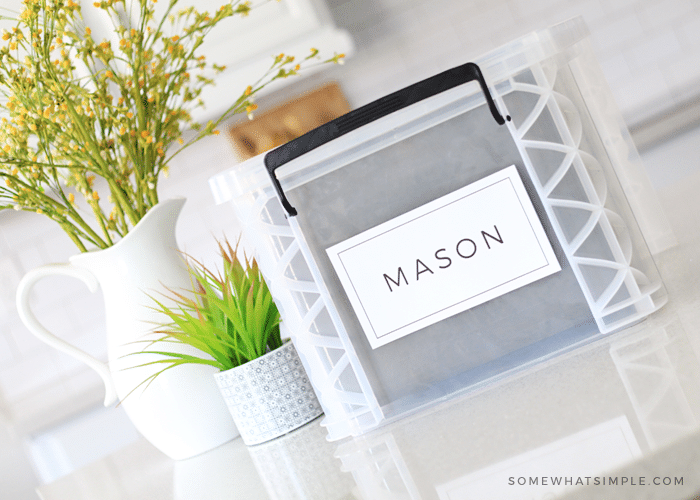 This file box is the easiest and simplest solution ever! 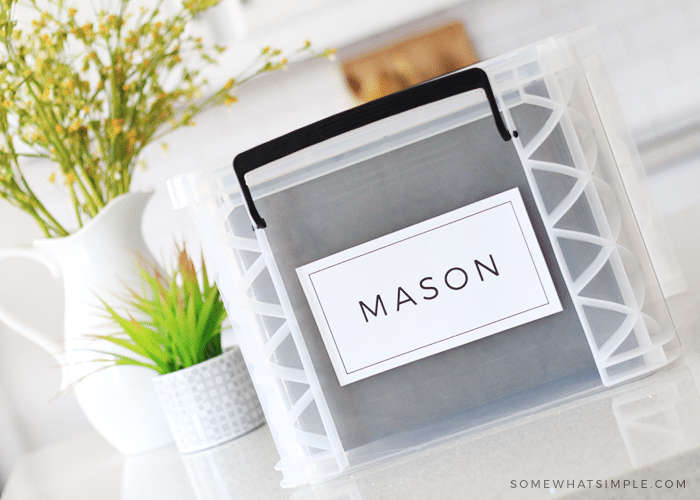 This organizational idea is an absolute favorite of mine. I can’t take the credit for it because I first saw this idea from my sister in law and decided to start using with my children. It is a system we have been using for 9 years now, and it is keeps everything in one place! 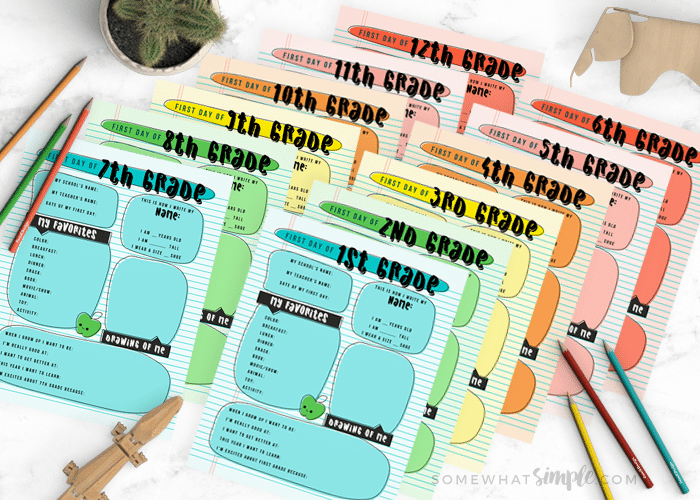 It’s a simple and easy way to organize all of the school papers you want to keep forever! First, make your labels. Using a word or paint program, type out all the grades, and make a name label for the front. 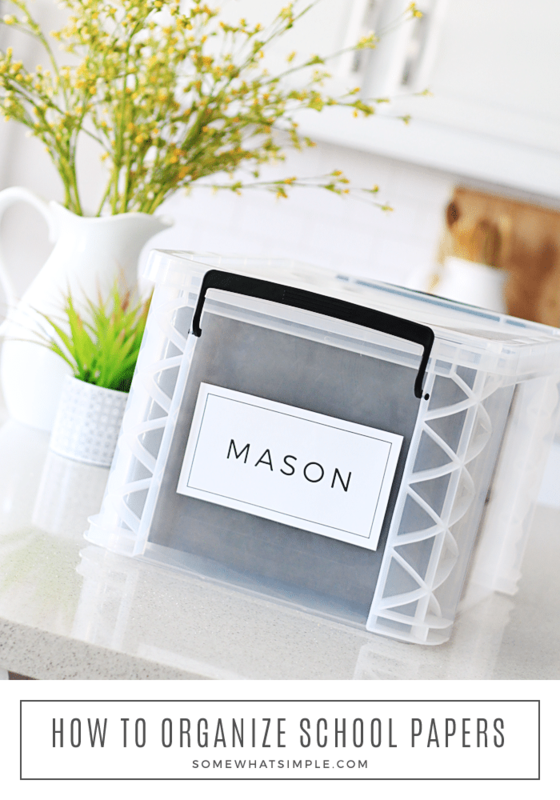 I added a simple black lined box to Mason’s label – I love how clean, simple, and beautiful it turned out! The font I used is called Montserrat. Print off your tabs and name labels. 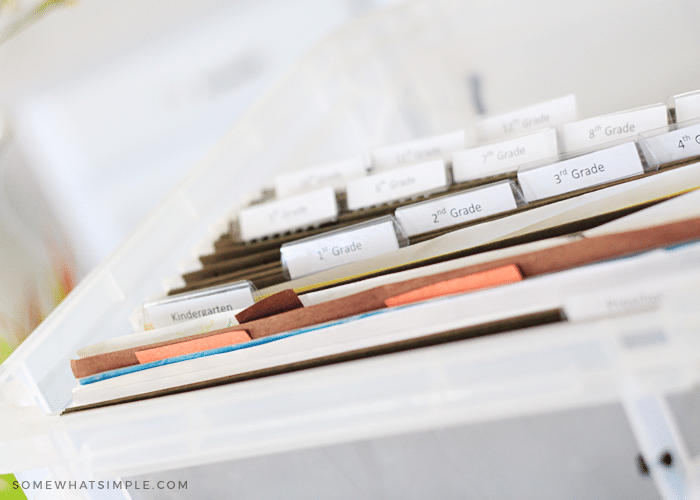 Add your hanging file folders and label them with each grade. Start adding all those school papers! 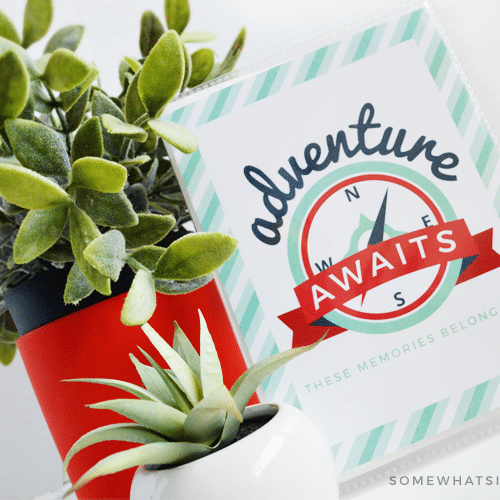 We also love our school interview printables – these would be the perfect addition to each year’s file! This post originally published in 2013, but was updated in 2018 with new images. This is adorable. I am going out to find those boxes. Thanks for sharing. I absolutely love this! My daughter is going into second grade and my son is entering Kindergarten. I have pretty much kept all of their school/preschool papers. I know I need to cut back and organize them and this looks like it will be a great way to do just that. I found the file boxes and some cute ribbon, however I cannot find cute/large font vinyl lettering. I have looked at Hobby Lobby, Michaels and Walmart. I cannot find what I am looking for. I am not a crafty person, so maybe I am looking at the wrong places. Can you tell me where you got the cute vinyl lettering. Hi Jennifer, thanks for the compliment! I actually made the letters with my vinyl machine. If you know of anyone with a cricket or silhouette they can make them for you very easily. The other thing you could do is print them off in a cute font and color on your computer and then cut them out and glue them to the box. I am surprised to hear that Michaels and Hobby Lobby don’t carry them though- I’ve never looked for them but I could’ve sworn people said they carry these types of letters. Good luck in your search! That is such a great idea! My son is only six and I already have a bunch of papers and pictures that need to be organized. This would be perfect. Thanks! I’m not sure what you mean- you buy the boxes already assembled and just add your own ribbon then fill it with hanging file folders- one for each year. Does that make more sense? 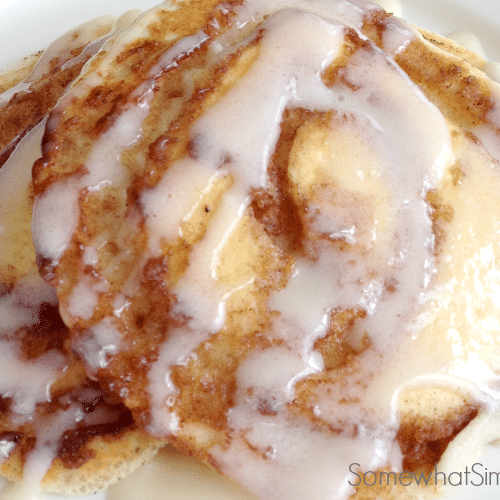 OMGosh those are so darling! I just love how you turned black plastic into something so cute! Thank you so much for playing with us on Talk To Me Tuesday. Oh I like this…I am still looking for a great system for school stuff and this might be it! Thanks for sharing…came over from Tip Junkie.